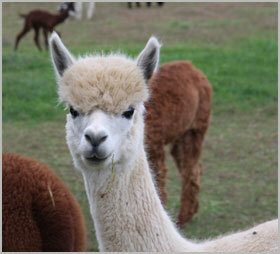 Scotia Acres Alpacas is located in Lumberton NJ in Burlington County, convenient to Pennsylvania, Delaware and New York. The property where the house and farm is situated has been utilized for agriculture since the early 1800’s. Jim Sr was born in Scotland, coming to the U.S. in 1962 at the age of sixteen. Marilyn’s ancestry is Scottish, Irish and German with family arriving in the U.S. in the late 1800’s. The Latin word meaning Scotland or Scottish/Irish is Scoti or Scotia. Therefore, Scotia seemed a good selection and the 53 acres of farm land became Scotia Acres. Our goal is to establish deep roots at Scotia Acres and continue to add to the 180 years of American history accumulated by the house and property. Hopefully, our two grown sons, Jim and Bill, will maintain that hope and prosper. The farm is a family run business with Jim Jr., the farm manager and Bill our photographer and computer specialist. Jim Sr. and Marilyn work on special projects, as well as the fiber element of the business. We all participate in the shows and events organized on our farm and the farms of other alpaca breeders for the purpose of selling our animals, breeding, and promoting the fiber business. The 1832 Georgian style farmhouse is constructed entirely of brick, including the inside walls. The majority of the brick was manufactured on the property. The main gate is crafted of antique iron from the 1800’s and the distinctive chimneys, with terra cotta tops, vent eight active fireplaces, and stand 40 feet above the ground. The house is situated on five acres and we have an additional 48 acres to accommodate our growing herd. As part of our commitment to the environment and being an eco-friendly farm, we installed solar panels in 2010. These panels contribute all the power to the farm during the daytime. With an eye for innovation and using and for using our natural resources, we are getting ready to sell our own Alpaca manure compost to our gardener and farming customers. Children love these gentle animals, including special needs children who find the alpaca to be fascinating and the alpaca, in turn, find them to be just as interesting. We are happy to schedule, by appointments for school group's, Girl Scout/Boy Scout troops. 4-H groups and just anyone who loves animals We welcome visitors and are always pleased to provide information on alpacas and our farm’s history. as well as an area where health records of the herd and breeding program details can be maintained and recorded. A heated room was recently added in the main barn to care for animals who may need a controlled environment or for new crias and mothers who need extra attention. The stalls and common areas are cleaned daily and sanitized weekly to avoid problems that come from unsanitary conditions. Each pen is supplied with 5 gallon water buckets, heated for winter, which are replenished twice a day all year long. We adhere to a strict regimen of immunizations as recommended by our veterinarian which includes yearly rabies shot for the entire herd. With the exception of the rabies shots, all immunizations are done by us. That is why we frequently schedule Herd Health Days and invite the public to see how we care for our Alpacas by trimming their toenails and checking their weight. Our Scotia Acres Alpacas team take pride in putting the health of our herd above selling. Throughout the year, the alpaca are given free-choice second cut hay and our Scotia Acres specially blended enriched grain. 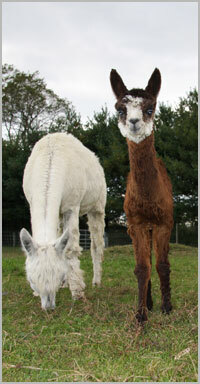 Spring is always welcome because pasture grass is, of course, the most perfect alpaca food. The amount of grain feed to the alpaca is adjusted accordingly when the good weather returns. Shearing is done once a year most often in May. We always have a number of people who love to watch and help with the process. The alpaca are not always happy participants but,once they have been shorn, they run off to the pasture kicking up their feet.